Join us at the Second Annual Fitness Fair at Ed Roberts Campus! Youth, adults, and seniors of all abilities welcome! Event is totally free! 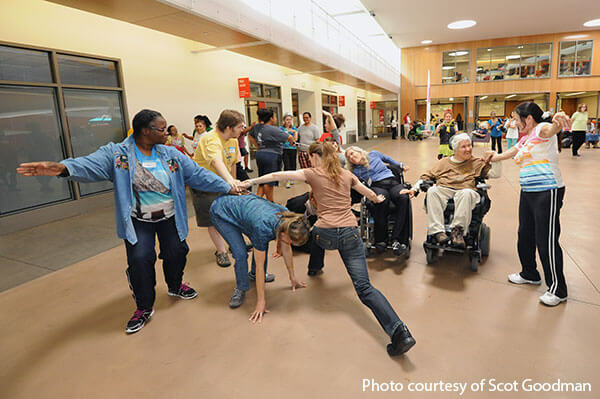 Learn about fun options to start or increase your healthy lifestyle, from teachers and leaders in adaptive fitness and recreation. View the day’s schedule of activities (PDF). Does “disability” and “exercise” seem incongruent to you? Do you struggle with finding options for your body and your fitness needs? Do you want to improve your health and find ways to have fun? Plus door prizes and raffles! The Ed Roberts Campus is at Ashby BART, 3075 Adeline Street, Berkeley, CA 94703. Fully accessible and scent-free space. Alternative-to-print material and ASL interpreter available. Pre-registration is not required for the day, but we would love to know how many people to expect, so please RSVP if you plan to attend! 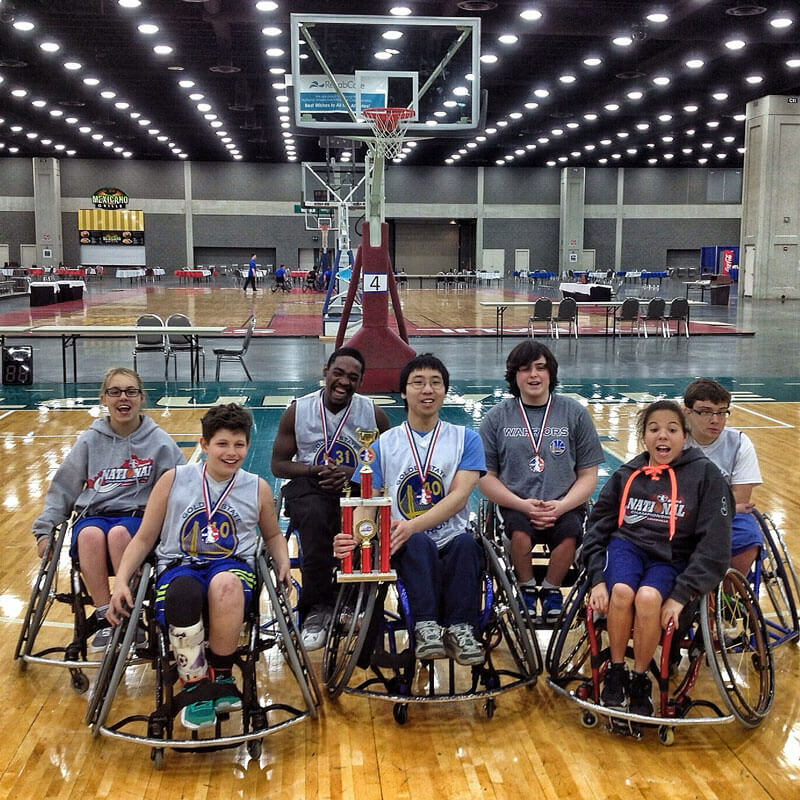 Congratulations to the BORP Jr. Road Warriors who returned home from Louisville, KY on Sunday after placing 3rd in the Junior NIT Division at the National Wheelchair Basketball Association (NWBA) Jr. Division National Championship Tournament. As the team left Oakland last week, there was a lot of excitement in the air and the kids were ready to take on the world. A quick stop in Los Angeles proved to be not-so-quick as the plane picked up the Rancho team on the way to Atlanta before heading to Louisville. After watching Rancho board the plane, the BORP coaches and parents found a new appreciation for our varsity kids and how efficient they manage themselves throughout the travel process. The flight to Atlanta was delayed, but Southwest Airlines graciously held the flight for the teams and we were able to make the connection to Louisville. To our surprise, there were members of three additional teams on the next flight and that means that there were a LOT of wheelchairs on one plane. In order to make sure all our equipment arrived in Louisville, Southwest needed to make space and that meant removing the wheels off all the chairs to make them fit in the cargo hold. This might not seem too difficult, but when you have over 50 wheelchairs, with 100 wheels removed, it turns into a small nightmare. Christie Levine is responsible for managing our chairs when traveling and she did an AMAZING job of getting all our equipment together and assembled, and everyone off the plane. Now, what does this all have to do with basketball? Everything! By the time the team got our equipment back together, picked up the rental cars, and drove to the hotel it was after 3:30am with a wake-up call scheduled for a mere three hours later! An extremely slow start had us down early. There just did not seem to be any sense of urgency and the kids acted like they were still asleep. We went down by 14 in the first half and finished the half down by 12. The 2nd half started with a bang. We turned up the heat and Koda, William, and Amit managed to create turnovers on the first few possessions. We still could not convert but this started to build the confidence the kids needed for the rest of the game. Over the next few possessions, we caused more turnovers and converted on three quick layups by Koda and Amit. The Pacers just looked flat and even when they were able to finally get a shot off, we ran it out and created scoring opportunities. Andre hit another shot and Koda came off a pick from Cortney to get the shot to bring us even. Griffen came in and gave us a few good minutes on defense and set some great picks for his teammates. Christie and Andre continued to apply pressure at half court and William, Amit and Koda continued to convert. 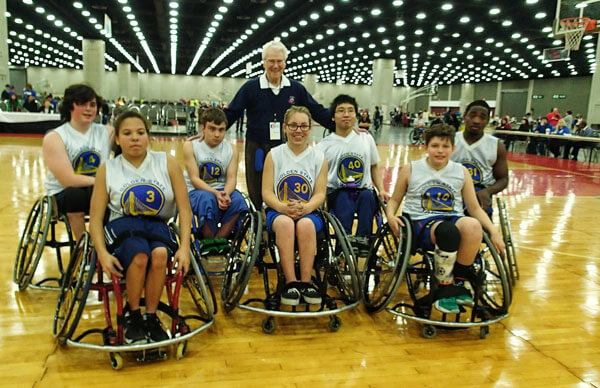 The Jr. Road Warriors went on to defeat the Pacers 38-32 to advance to the next round. This was an incredible TEAM win and watching the kids come together in the 2nd half was just beautiful. This game was over before it began. The team had developed a new level of confidence in the first game and for the first time this season, applied this confidence from the start of the game. The kids pressured the Komets from the tip off and held them to 5 points in the first half. Koda, William, Andre, and Christie were shutting everything in the backcourt off and just when the team was hoping to be able to advance the ball they would run right into Cortney. The BORP kids became a wall. A kind of odd wall, made up of paralyzed legs, scoliosis, spasticity, wheelchairs, and a whole lot of attitude – but a wall nonetheless! With the kids having only a few hours sleep this was honestly not what we expected. There was simply no let-up defensively. Griffen came in and was able to stop a couple of breakaways and Amit read the court like a book, taking advantage of open space and converting his lay-ups. William, Christie, and Koda just kept applying more and more pressure and the Komets kept cracking. One highlight of the game came during a scramble for a loose ball. Andre and their biggest guy both had control when Andre went into Hulk mode and ripped the ball out of the other player’s hands. He actually lifted the other player off the ground when he did this, and you could see that from that moment, the kids were not going to give the game away. The Jr. Road Warriors went on to post a 35-19 victory and advance to the NIT semi-finals on Friday. The entire day was such a display of maturity and resilience. Not once did the kids say they were tired, or make any excuse for anything. On three hours of sleep, the BORP squad got up to go play basketball, and they played as a TEAM. We all know how important that is, because; Together, Everyone Achieves More! On Friday, the game did not go as planned and the team lost the opportunity to advance to the finals. It was obvious that the travel woes had caught up to us and the team came out flat. There was just not the same level of intensity from the team and even after going up by five points early, the Jr. Wheelers just had more energy on the court. Slowly and steadily, they pulled away and we just could not match the energy level to reel them in. Unfortunately, BORP lost 48 – 37 and had to settle for playing for 3rd place on Saturday. There is always a positive side. The kids were fortunate enough to have a special guest come and watch the game. 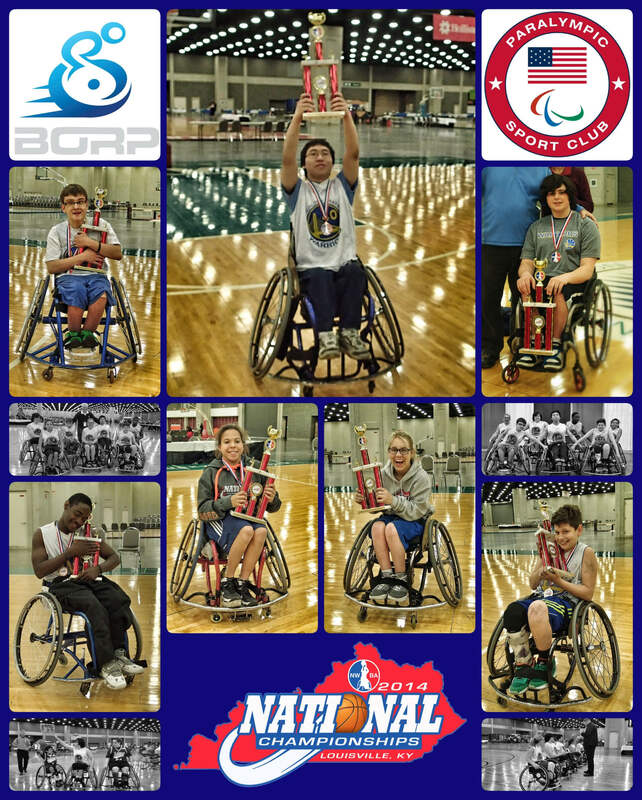 Dr. Tim Nugent, the founder of the NWBA and the man responsible for developing the sport back in 1945 came over and took some photos with the kids. Like Chicken Little says – today is a new day! That was the theme for Saturday’s game. Saturday’s final game also marked the end of a nine-year BORP basketball career for William Luong. Everyone was excited for him and you could tell from the beginning that the kids wanted William to finish on a positive note. The press was on and the kids stormed them like bees. William, Andre, Amit, and Koda swarmed the back-court and Cortney closed off everything at half court. We were able to get multiple 10-second calls and create additional turnovers with the pressure. Offensively, William took the game into his own hands hitting almost every shot he took. Throughout the game, Christie, Cortney and Amit would set picks for Koda and when the defense would adjust, William would wind up in the key and Koda would find him for the lay-up. It was a thing of beauty to watch. Our defense remained consistent throughout the game, and even when Amit struggled offensively, he was able to turn right around and play incredible defense. Griffin was able to use his speed and chase down and stop their transition several times. Christie and Andre were calling out their switches and Cortney was able to anticipate moves and get in position at half court to stall their momentum. She even grabbed a few rebounds. Christie’s defensive confidence grew throughout the game and she was able to take more chances and recover faster. Andre cleaned up his passing and we were able to get good looks on most of our possessions. Andre hit a couple of baskets to add to the score, and Koda was able to get on track from both inside and out. William, though, stole the show. Not only did he hit the majority of his shots, he hit them when we needed them the most. Most of his baskets stalled their run, or came when we had not been able to score for a while and needed something to fall. It was just his day. The Jr. Road Warriors went on to defeat the LSWRA (Illinois) Falcons and take 3rd place. It was an incredible end to the season, and a fitting way to have William leave us. The entire weekend was amazing. There was a new energy with the association with the Road Warriors, and it was great to see the Road Warriors (the adult team on which coach Trooper Johnson plays) line the side of the court cheering on the kids. There was more of a family atmosphere between teams, and the kids would immediately head over and show the same level of support when the Road Warriors played. 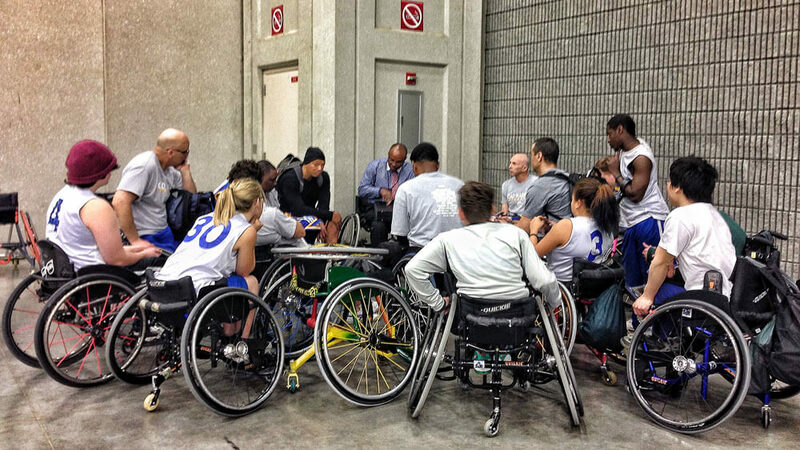 At the end of each game, the two teams would come together and it was incredibly powerful. Overall, this experience is much more than basketball. There were 29 varsity teams represented in the Varsity and NIT tournaments, and an additional 11 Prep teams competing in the tournament. That is almost 400 kids with physical disabilities under one roof, playing basketball and just being kids. Also competing were Championship Division (Senior Elite) and Division III teams (community based teams) so kids could see the top players from throughout the US. There were representatives from every college program in the country and Cortney and Christie attended a transitions seminar where the colleges presented information to help the kids make the step from high school to college. There were booths from all the major sports equipment manufacturers, events for the kids, and much, much more. On Saturday, there was a dance for the Jr. athletes and the kids got to see all of their friends from around the league, some of them for possibly the last time as the seniors move on. The tournament was incredible. Big thanks to Asst Coaches Richie Bennett and Steve Lau for everything they did throughout the weekend to support the team. It is hard to be in several places at once and they make sure the details are covered. Also, the Ahlstroms – thank you both for all the support throughout every tournament. We are looking forward to next year when we have both of your grandsons on the court. Finally, to the Luongs – There are not enough words to express BORP’s appreciation for what you have done over the years. Most importantly, for bringing William every week, and all the granola bars ;). Thank you, thank, you, thank you!